Acclaimed biographer James McGrath Morris discusses his just-released biography, Ethel Payne, First Lady Of The Black Press. Few Americans today have ever heard of Ethel Payne, much less understood the giant role she played in reporting the story — and advancing the agenda — of the civil rights movement in America. Through Payne’s riveting personal story, Morris takes the reader on an inspiring journey through the civil rights movement — and to a greater understanding of issues that continue to resonate strongly today. The great civil rights struggles of the mid-twentieth century, with their emphasis on non-violent political action, depended crucially on press coverage to gain impact — and, ultimately, success. But their stories may have gone untold were it not for newspapers like the Chicago Defender and other organs of the black press. They broke the stories that the white mainstream media picked up and disseminated to a wider audience. Yet few in that wider audience even knew of the existence of the black press. Perhaps no reporter was more important Ethel Payne, star reporter and Washington Press Corps correspondent for the Chicago Defender, the black press’ paper of record from the years of the Great Migration through the civil rights movement. Dubbed “the First Lady of the black press,” she told the world about a young leader emerging out of the civil rights movement in Atlanta named Martin Luther King, Jr. She told the story of Emmet Till’s mother, who had to view the badly mutilated body of her 14 year old son after the brutal beating that took his life. She hammered a nail into the coffin of McCarthyism when she reported on the persecution of a lowly African-American Pentagon employee absurdly accused on being a Communist spy. The first African American woman to be part of the White House Press Corps, she courageously buttonholed presidents with searching questions about racial prejudice and civil rights. Unlike many of her colleagues then and now, she was no mere stenographer but held the powerful to account for their policies and views. Yet few Americans have ever heard of Ethel Payne, much less understood the giant role she played in reporting the story — and advancing the agenda — of civil rights in America. 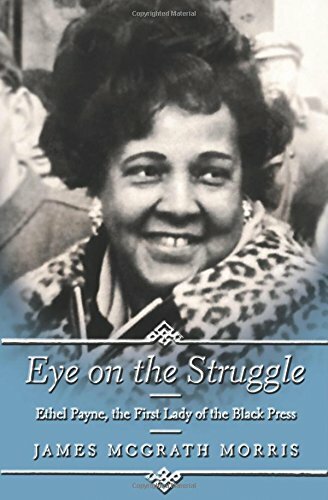 James McGrath’s spellbinding biography of Payne, Eye on the Struggle: Ethel Payne, the First Lady of the Black Press, amply corrects the oversight, bringing Payne’s story to light within the context of her history-making times. In addition to Eye on the Struggle, James McGrath Morris is the author of the acclaimed biography Pulitzer: A Life in Politics, Print, and Power and two other books. He produced the following video clip about Payne. Also, view C-Span’s Carrie Collins talking with Ethel Payne here.